Remember that amazing Cheddar Ale Soup recipe I posted last week? Well I have been keeping a secret from you, I have another addition that makes the soup even BETTER! These little puff pastry bites are the perfect addition to any soup or just by themselves. What is even cooler is how easy it is to customize this recipe with your own filling ideas. 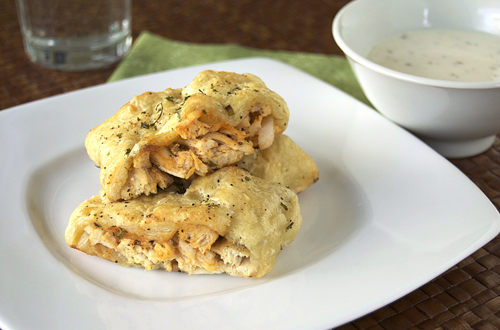 The options are endless for these little homemade hot-pocket-type bites. In a bowl, combine the shredded chicken, garlic, basil, oregano, parsley, pepper and salt. Spread the butter in a straight line down the center of the pastry dough. Line the chicken on top of the butter. Wrap the dough around the chicken, pressing the seam until sealed. These look and sound so delicious!! Saved in the recipe folder! I’m so glad I stumble upon your blog durinng dinner time instead of late night hours, otherwise where can I find food to stop my cravings! These look delectable. 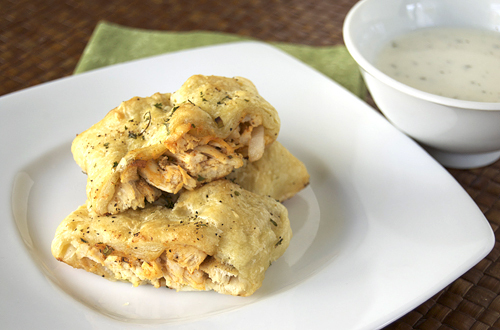 Savory stuffed puff pastry — YUM! These look super yummy!! Good luck on your job interview! Those look like a great lil appetizer! These sound so simple yet delicious! Yum! Hope you got the job!! This recipe from a couple of years ago is one I found on the internet today when looking for a recipe for pastry chicken bites. I think the puff pastry is a great idea, but I would like to see individual little packets. That should not be hard to do with this recipe. Could the chicken use a little moisture such as a mayo/orange juice mix or caramelized onions? Now I want to experiment from your base. How did Honolulu turn out?